Favilla Soprano Ukulele (1950's), made in New York City, natural lacquer finish, mahogany body and neck, rosewood fingerboard, original brown canvas gig bag case. Overall length is 20 7/8 in. (53 cm. ), 6 1/2 in. (16.5 cm.) wide at lower bout, and 2 3/16 in. (5.6 cm.) in depth at side, taken at the end block. Scale length is 13 1/2 in. (343 mm.). Width of nut is 1 7/16 in. (36 mm.). This uke is super clean overall; just some checking to the sides, especially on the treble side. Really looks to have hardly been played since new. 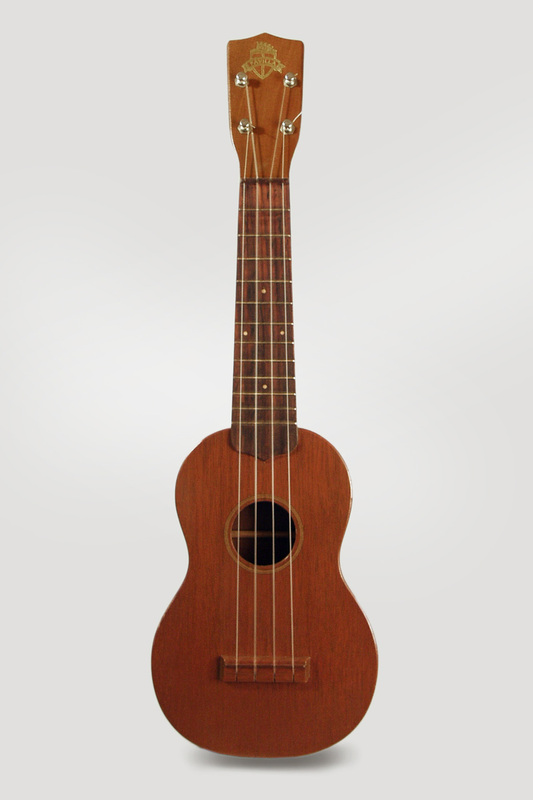 Nice-sounding like most of these little New York gems; the best "non-Martin" vintage 1950s ukulele. Excellent + Condition.